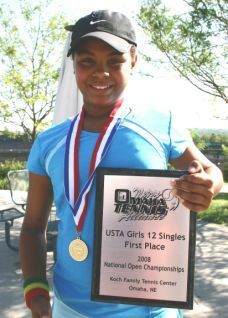 USTA Central Arizona juniors Alexandra Letzt, Garret Dunn, and Andy Nguyen recently picked up titles from USTA National Open events held the week of June 28-July 2. Letzt won the Girls 12 singles crown in Omaha, Neb., and Dunn and Nguyen paired up to win the Boys' 18's doubles crown in Denver, Colo.
More than	40 of the Section's top juniors participated at various USTA National Open events during the week. National Opens are level	2 national events that feature the best young players in the country. These events are held four times per year at	a variety of tennis centers across the country. Letzt and Nguyen began their torrid summers with victories at the USTA Southwest Junior Closed in mid-June in Tucson, and have continued their success. Letzt (Scottsdale, Ariz.) was the top seed in the Omaha tournament, which was held at Koch Family Tennis Center. She lived up to her seeding, rolling through five matches without dropping a set en route to her Girls' 12 title, with victories over two seeded players. In the final, Letzt took out sixth-seeded	Brigitte Desnoes (Indian Wells, Calif.) by the score of 6-2, 6-2. Nguyen (Phoenix, Ariz.) also had a	terrific	National Open week, reaching the final in both the singles and doubles draw at the 18's tournament held in Denver, Colo. at the Gates Tennis Center. Seeded 10th coming into singles, Nguyen rolled through each of his six matches without dropping a set, and finished the tournament	in strong fashion,	beating 12th-seeded Bryan Welnetz (Laredo, Texas) 6-2, 7-5. In the doubles, Nguyen and	fellow USTA Southwest junior Garret Dunn (Tempe, Ariz.) paired to win	five matches in the tournament,	including an 8-3 win over	Denis Bogatov (Gurnee, Ill.) and Etham Frenkel (Long Grove, Ill.) in the final. The	USTA Southwest Section	also had two facilities play host to USTA National Open tournaments, both in El Paso, including a Boys/Girls 14's event at El Paso Country Club (EPCC) and a Girls' 18 event at the El Paso Youth Tennis Center. Albuquerque's Thomas Cooper reached the finals in Boys' 14 doubles at EPCC, partnering with Howard Weiss of Great Neck, N.Y. Cooper also reached the Round of 16 in singles. *Nolan Bauer (Phoenix) - Round of 16 singles in	Boys' 14 in Long Beach, Calif.
*Carlos Bermudez (Tucson, Ariz.)	- Quarterfinals of Boys' 16's in Lakewood, Calif.
*Cole Horton (Phoenix, Ariz.) - Round of 16 in Boys 12 Singles in Beaverton, Ore. Most of the Section's top-ranked juniors will now move on to age group events at the USTA National Clay Courts and then take part in team events before finishing the summer off in mid-August with the USTA National Hard Courts.